"There are two things we give our children. For children under 3, please ask us about our Family Room where the parents can be a part of the service and the children can be children. It is a room off the sanctuary that allows you to hear the service and your child to play. We also allow children to sit in the sanctuary with their families. Sitting in the last two rows allows you to sneak out for a few minutes if you feel that is necessary. Our preschool room is for children ages 3-5. They have lots of time to engage and interact with their peers. At the end of their time together the children participate in an age appropriate meditation and song/dance time. Our Children’s Church is staged for children ages 6 to 12 and is based on a multi-age format. With prayer & meditation time included. Our Youth of Unity program is beginning March 4th. Teens ages 13-17 are welcome to attend! If your child feels most comfortable sitting with you during the service, we honor that. 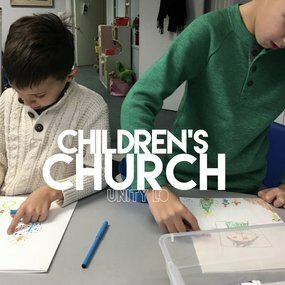 Children do not have to attend the children's programs. We encourage them to join us in the back when they are ready. Our children’s church facilitator provides a loving, nurturing environment for your child to begin their spiritual growth in life. A well-founded spiritual curriculum is provided to reach each child’s age and level of understanding. It is designed to meet the spiritual, psychological, emotional, physical and social needs at every age level. By using the spiritual principles we teach the students through open communication how they can best use those principles to empower their life. If you have any questions regarding our Children's Church, please email Miss Jackie at unitylakeorion@gmail.com.